Virtual disk multipathing enables you to configure a virtual disk on a guest domain to access its back-end storage by more than one path. The paths lead through different service domains that provide access to the same back-end storage, such as a disk LUN. This feature enables a virtual disk in a guest domain to remain accessible even if one of the service domains goes down. For example, you might set up a virtual disk multipathing configuration to access a file on a network file system (NFS) server. Or, you can use this configuration to access a LUN from shared storage that is connected to more than one service domain. So, when the guest domain accesses the virtual disk, the virtual disk driver goes through one of the service domains to access the back-end storage. 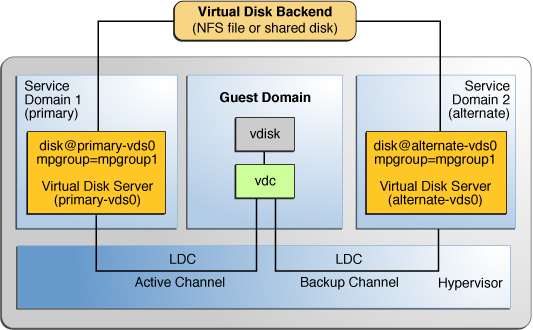 If the virtual disk driver cannot connect to the service domain, the virtual disk attempts to reach the back-end storage through a different service domain. Note that the virtual disk multipathing feature can detect when the service domain cannot access the back-end storage. In such an instance, the virtual disk driver attempts to access the back-end storage by another path. To enable virtual disk multipathing, you must export a virtual disk back end from each service domain and add the virtual disk to the same multipathing group (mpgroup). The mpgroup is identified by a name and is configured when you export the virtual disk back end. The following figure shows a virtual disk multipathing configuration that is used as an example in the procedure How to Configure Virtual Disk Multipathing. In this example, a multipathing group named mpgroup1 is used to create a virtual disk, whose back end is accessible from two service domains: primary and alternate.